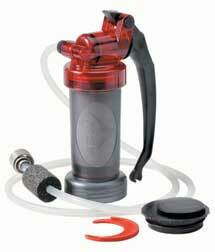 Water purification filters are the fastest, most convenient, and best tasting way to purify water. They vary greatly in type from survival straws to larger hand pumped units. Water filters also offer another significant advantage over the types of water purification, they actually produce CLEAN water. Iodine and bleach will kill most all bacteria, but they do not remove dissolved solids including possible toxic contaminants. Small personal filters that resemble large mechanized straws. They will allow you to simply drink directly from an unclean water source. Larger devices that produce significantly more clean water at a faster pace than any other available method. Largest of all the filters, gravity fed filters enable large amounts of water to be filtered daily. The Big Berkey, for example, in a ceramic four-filter configuration, will filter up to 30 gallons. If using the black filters, the Big Berkey will actually purify up to 30 gallons a day. Of course, these are not easily transportable in a BOB. They are to be used at bug-in location. This page was last modified on 29 March 2014, at 03:45.